Dental implants are now a standard of care in tooth replacement. It is Delaire Dental’s mission to use dental implants as a way to transform the aesthetics and function of our patients who feel restricted by their missing teeth. Our dental implant patients feel confident and secure in their new smile. Our patients are able to function with their new teeth the same way they would if it were their natural teeth. 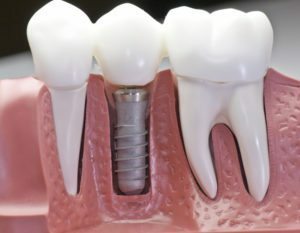 Implants use artificial titanium roots that are placed in the area of a missing tooth or teeth. The titanium implant then has a porcelain crown or bridge placed on top, which functions as a natural tooth. They are easy to clean and have the potential to last a lifetime. Implants not only replace missing teeth, but they also prevent the drift of adjacent teeth into the open space, a condition that can greatly affect the appearance and function of the entire mouth. Implant therapy is a predictable, reliable treatment for tooth replacement. The first phase of dental implant therapy is the placement of the artificial root. In some cases, bone grafting may be performed to support the structure of the jaw and tooth. After the implant is placed, the area is allowed to heal and reform bone around the new artificial root. Once this has occurred, a porcelain crown is placed on top of the implant. Delaire Dental offers dental implant consultations in our Midtown, New York dental office. Our interactive patient education program explains the entire process, and Dr. Lee will sit down with our patients to discuss the implant options that are most appropriate for their individual needs. Call our office today to schedule your consultation appointment.